From the very beginning, Christianity has been the faith of world-changers, rejecters of the status quo, and rebels. So when did it get so safe? Reclaim your roots with Dangerous Prayers, a collection of prayers from people throughout history who took God at His word and changed the world forever through their faith. Life with Christ was never meant to be boring. Throughout all of history, God has invited His followers into spectacular callings and daring missions to impact the world through radical love and generosity. So how have Christians today come to expect that Christianity is safe? 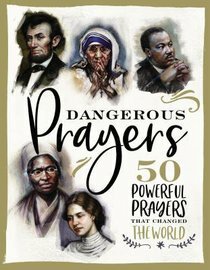 Reenergize your faith with Dangerous Prayers: 50 Powerful Prayers That Changed the World, an inspirational compilation of character profiles, struggles, and some of the most famous prayers of people who made great strides for the gospel. Ranging from saints, martyrs, political leaders, and cultural figures, this book offers you a rich visual experience to explore the power of a dynamic relationship with God. From St. Francis of Assisi to Joan of Arc to Harriett Tubman to Dr. Martin Luther King Jr., and many more, God can use ordinary people with ordinary lives to do extraordinary things for Him. No matter your age, position, or status, praying dangerous prayers will change your life and, likely, the world around you as well. There is wisdom to be gained from the prayer lives of spiritual giants, and Dangerous Prayers will invigorate your spiritual journey as you consider those who came before you. Prayers are beautifully illustrated with portraits of each person who prayed a dangerous prayer. This four-color book is a perfect gift for any Christian and for history lovers. About "Dangerous Prayers: 50 Powerful Prayers That Changed the World"